Book Trailer Online at YouTube! 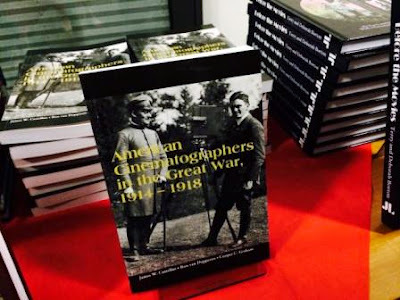 Now that our latest book on the American cinematographers of the First World War is available it is time to reveal more of the contents. So, here is the book trailer that has just been uploaded on YouTube. While we were in Pordenone for the book presentation of American Cinematographers in the Great War we did an interview for the Slovenian television, which recently was broadcasted. Here's a chance to see and hear us talk about World War I and the impact it had on film history. For those of you who do not understand Slovenian, don't worry. After a brief introduction you will hear all three authors talk in English on our recent book and film research. Check out the video for the TV interview!